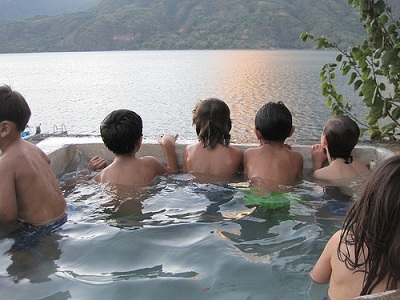 Lake Atitlan is one of the most beautiful places to visit in Guatemala. It’s also a super cool family vacation spot. So when my girlfriends and I decided to take the kids for a fun adventure I suggested we head over there and they all agreed. I found a lovely hotel by the lake that offered cottages called Posada de Santiago. So each family had one cottage to themselves. This trip was incredibly fun but a bit complicated. Our Girlfriend getaway consisted of four girlfriends, two nannies and eight boys! It was crazy! We managed to have some peaceful moments because of one of the best features of the hotel – there was a huge front yard with a killer view where the kids could run until they had burned out all their energy. I thought the pool would be a big help. However, what actually happened was the wind was so insane, the water was freezing and there was a tiny jacuzzi where the cauldron of kids heated up and stirred up chaos. It was fun but for short periods of time. We didn’t spend all the time in the hotel. 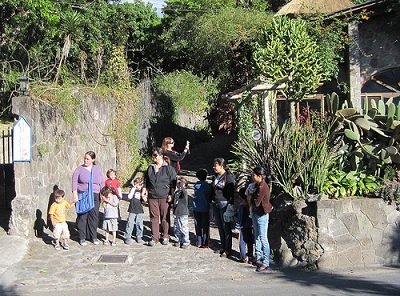 We decided to take the kids for a tour of Santiago de Atitlan, which was a treat in itself. We had a lot of fun! Two days into the trip our men (husbands) arrived. This helped a lot to relieve all the madness of dealing with all those kids. Eventually we found ourselves doing almost nothing. But even though there were tons of boys, for some reason we never had a chance to simply sit and even watch a single movie! But the best of it all was being able to spend some time with friends, relax by the lake and being very happy to see the husbands! Marina K. Villatoro is an expat living with her family and traveling in Central America for over 10 years. You can get more fun info by following her on twitter and becoming a fan on facebook.